I feel like a kid on Christmas morning!! I'm SO EXCITED to be able to share some really amazing products with you this month! I can't wait for you to see all of them! THIS WEEK.... I'm giving away to ONE lucky reader TWO amazing prizes courtesy of Stick Me Designs and Tips 4 Type 1! Stick Me Designs is giving away one of their best selling items - the HOOT DELUXE CLUTCH! This awesome bag is 9 1/2" x 7 1/2" x 3" thick. It is constructed of heavy denier nylon, durable cotton upholstery weight fabrics. It's even machine washable! I can tell you how incredible this bag is because I have one!! I was a lucky winner of this goodie when Shannon @ The New Normal Life gave one away. And I fell in love! I wanted a bag that would hold EVERYTHING and yet still be small enough to throw in my purse. And this bag is it! In our bag, I carry around: the Omnipod PDM, test strips, Accu-chek Multi-clix lancing device, extra drums of lancets, alcohol wipes, extra batteries, adhesive remover, glucagon, syringes, insulin, extra pods, stickers for the pod (decoration - it's a must), juice boxes, smarties, starburst, m&ms, EMLA cream, and the Precision Blood Ketone test kit. And there's still room for more! This is the best bag I've had. I swear! I love it!!! TIPS 4 TYPE 1 is giving away a set of their incredible nail polish! This polish comes in a set of two colors: TRUE BLUE HOPE and TIPS OF STEEL! Tips 4 Type 1 is the brainchild of Tonya Homme - a D Mama who is determined to raise awareness about type 1 diabetes and to raise money for the Diabetes Research Institute! She began Tips 4 Type 1 after seeing an add for pink nail polish and thought that someone should do the same thing for diabetes research. And she decided that someone was going to be her. Yeah, a lady after my own heart! TEN DOLLARS from each purchase is donated directly to DRI. I really admire Tonya and her dedication to awareness and research! And I REALLY love this polish! I'm SO going to have get a set for myself Sweetpea! I'm thinking stocking stuffer?!? But YOU can win a set now!! AND the Hoot Deluxe Clutch! Winner takes all! 1.."LIKE" Stick Me Desings on Facebook! And "FOLLOW" Stick Me Designs on Twitter! You can even leave her a little note telling her how awesome the bags are and that The Princess and The Pump sent you! 2. "LIKE" Tips 4 Type 1 on Facebook! You can leave her a little note telling her how cool her polish is and what an amazing advocate SHE is... and that the Princess and the Pump sent you! 2. Leave me a comment before midnight (EST) Thursday, November 10, 2011. Include your first name (comments left with out a name will be eliminated). Of course I follow you on Google !! I love the owl bag and I know my daughter would love the nailpolish! Looks like the boy may miss out!! I love the bag!! That pattern is so cute!!! The nail polish is awesome! What a great give away. By the way I tried to ''like'' Tips 4 type 1 but the link does not work!? LOVE LOVE LOVE this giveaway!! Fingers Crossed!! Love love love x100! I commented, tweeted, and all! Hope to win...fingers crossed! I just went and liked the Facebook pages and followed the Twitter page. LOVE that bag by the way-- it looks perfect! #2 I just "liked" you on Facebook. Sign me up... Elise LOVES owls! #3 Following Stick me designs blog - dropped a little not to let them know you sent me too! Great giveaway Hallie! I already "like" both companies on FB!! I would love to win this for Sweet Ava!! Count me in! AND I already like TPATP on facebook! Woo Hoo! Fun! Sign us up! I liked them both on Facebook, I don't do Twitter though. Their products look like they would hold everything I would need. I would also love to win this for Sweet Ava! I already "liked" your facebook page. We NEED a carrying case for our supplies and this clutch looks awesome! Would love to win it! 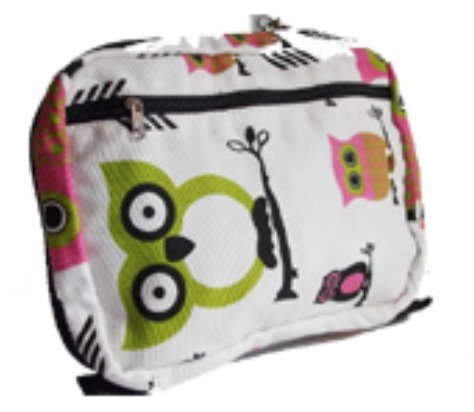 FBooked, liked, shared, Love the Owl bag, Thanks for the fun giveaway and introducing me to another great product! I just liked "Tips 4 Type 1". For those having issues on Facebook, try typing their name without any spaces. I already like Stick-Me Designs! like your facebook page :) count me in for thee draw, would love to win this for hayden ! too cute. awesome blog btw ! I Liked tips 4 type 1! I'm kinda obsessed with nail polish and nail art! If I don't win I'll have to get some!!!! I Like you on facebook!!! Would love to win! Love your blog!! Love the blog...love the giveaway. Love the blog...love the giveaway! Like you both, follow you both and all that! Count me in! Please enter me! I would love to win a new meter case! And I also already follow both companies on facebook! I like Tips 4 Type 1 on Facebook! I like Stick Me Designs on Facebook! I like Princess and the Pump on Facebook! I love this giveaway! Can't wait to see who wins. I "Like" Stick Me Designs on Facebook (and it is actually in my page's favorites for "Aliza's Diabetes :-)" which is my dBlog FB page). I also left a note on the Stick Me Designs Facebook page about the super awesome giveaway this week from The Princess and the Pump. I "Like" Tips 4 Type 1 on Facebook (and also added it to my "Aliza's Diabetes :-)" blog's Facebook page's favorites). I also told them that The Princess and the Pump sent me! I LOVE the blue and Silver and what you are doing for diabetes advocacy and fundraising for DRI. The Princess and The Pump sent me ... she is doing a great blog giveaway this week, including your super cool polish! I already "like" The Princess and the Pump on Facebook, and have it in my blog's Facebook page, Aliza's diabetes :-)'s "Favorites" rotation. Posted to Facebook about the giveaway! I liked Tips 4 type 1 on Fb.